The cleanliness of the air you breathe inside your home is very important. Indoor air pollution is one of the biggest, yet often overlooked problems in our society today. Every day activities such as walking, vacuuming and dusting stir up millions of particulates in your home. These particulates often include pollen, dust mite, pet dander, mold spores, debris, bacteria, and even viruses. All of these airborne pollutants can cause serious and even detrimental effects on your immune system. Fortunately, there is a solution. Air cleaners have been proven to be very beneficial to your overall health. They reduce allergies, sinus problems, respiratory issues, and even have been shown to help you sleep better at night. Whole house air purification systems are especially recommended for better air quality inside of your home. Although there are different types of whole house air purification systems, the Trion Duct Mount HE Plus 1400 can be especially useful. 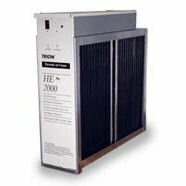 The Trion Duct Mount HE 1400 is recognized for having the strongest cabinets, most reliable power supplies and the sturdiest cells within the industry. The Trion HE Plus 1400 is designed to mount to the duct work in your heating and cooling system. It allows recirculated air to pass through the cleaner and prevents airborne contaminants from being constantly recirculated throughout your home. In addition, it captures 95% of airborne pollutants as small as 0.1 microns in size, and comes with a three year limited warranty. Don’t let indoor air pollution be a problem in your home. Get the Trion HE Plus 1400 and ensure that you are indeed getting a breath of fresh air for you and your family.